You’re about to find out if you’re using some common English verbs (insist, mention, suggest, reply and discuss) correctly. You might also like 3 Classic Mistakes That English Learners Make. It doesn’t matter where you’re from or what your first language is (unless it’s English, of course), there are some verbs that I bet you’re getting wrong. Because I see it all the time! 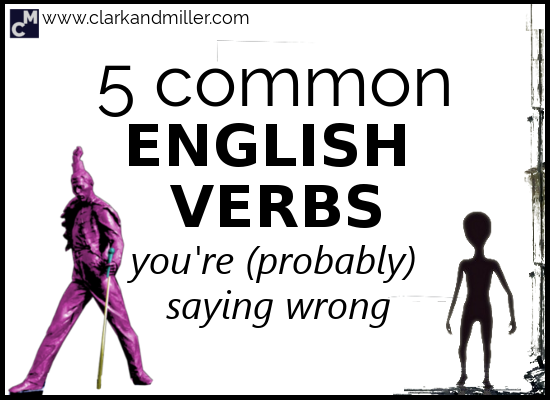 In all my (almost) 14 years’ experience teaching English, there are five verbs that I hear almost everyone get wrong … almost all the time. But are you getting these wrong? Then we can have coffee — or something. Most full English sentences have at least three parts — a subject, verb and an object (SVO). Harry (subject) met (verb) Sally (object). This is very, very simple, but also — especially for English — very important. Most English sentences follow this SVO structure. OK. So what’s wrong with “I insisted my sister-in-law to meet me”? Well, this is completely wrong! That’s because with “insist” (and all the other verbs we’re looking at today), the person we’re talking to isn’t the object. That means that we don’t “insist someone to do something” It just doesn’t work. So what do we say instead? There are two subjects here: “I” (the subject of “I insisted …”) and “she” (the subject of “she met me …”). But what if both of these subjects are the same? For example, you want to take a nice, quiet walk by the lake. Then your annoying friend says he wants to come with you and talk about Leonardo Di Caprio’s troubled childhood the whole time. There’s one more way we can use “insist + that + SVO” when both subjects are the same person — but with a slightly different meaning. He (She? It?) walks up to you and starts talking, in impressive detail, about the motorway system in eastern Finland. You’re impressed — he knows all the terminology and geography and everything. Then all of a sudden, he’s gone — vanished into thin air! Amazing, right? You’ve got to tell someone. So you call your best mate, tell her, and she just laughs; of course she doesn’t believe you. You want her to believe, though. So you keep trying to convince her that what you saw was real and that — no thanks — you don’t need to see the doctor. I insisted that I’d finished the crossword in 5 minutes — but he wasn’t having it (didn’t believe me). He keeps insisting that he saw Jerry in the bookshop, but Jerry’s been out of town for weeks. You need to say what you mentioned BEFORE who you mentioned it to. “But how can I do that correctly?” I can hear you ask. Well, again there are two ways of using this verb. Come to think of it, I don’t think Zara’s even in town. So who’s in the bathroom? Once again, there are two ways you can use this verb. And again, there are two ways we can fix this. But sometimes, we use “reply” to describe exactly what he said. Then he came to my office, and I asked him again. He replied that he couldn’t respond to my email because the internet wasn’t working. OK. So “discuss” only works with a noun. But what if your boss wanted to discuss some sort of action — like how her husband sings in his sleep? This phrase is super useful. She highlighted the fact that I couldn’t sing properly. We need to consider the fact that it costs over $1,000 dollars, don’t we? He may be annoying, but you can’t ignore the fact that he’s almost always right! Now you can (hopefully) use these 5 common English verbs … like a pro! Remember that “that + SVO” is a very, very useful formula and very, very common in English. What was the last thing you had to insist on? Did you get your way in the end? Has your name ever been mentioned in a newspaper? When was the last time you suggested something to a lot of people? Did you end up doing it? Have you ever written to anyone famous? Did you get a reply? What did they say? When was the last time you had a long discussion with someone? What did you discuss? A fairly frequent pattern is when there is a different subject for the gerund in the form of either the genitive case( e.g. Peter’s, my friend’s, ) or a possessive adjective( e.g. my, your, their). Compare: I insist on going there( the same subject) vs. I insist on Mary’s going there. (different subjects)./ I suggest doing it later vs. I suggest your doing it now. But good point and a great addition to the knowledge. Thanks! May I suggest swapping second and third columns in the table? It would have gained the logical structure «verb – phrase – example» and become more memorable. 1. Last time my wife was opposing visiting my parents but I insisted on it. 2. Yeah. Just once. Our local newspaper mentioned that I look like some hollywood star 🙂 I don’t even remember his name because I didn’t see the issue and I knew about that fact from my parents and collegues. 3. Not long ago I suggested spending together our May holidays somewhere outdoors to my teammates, but our department is not so big and the other departments are too far away. And I’m still waiting for their reply. 4. Nope. I’ve never written to any famous persons, because I know they are busy and I dislike to annoy people with some trifles. It’s funny you suggested that, Eugene. At the last minute I thought that those columns should be this way round. Here’s my reasoning: it’s better to see the language in action before seeing the structure: assimilation before analysis. Of course, at the end of the day, everyone’s different and what works for some doesn’t work for others. 1. A familiar situation! The classic “in-laws” scenario! 2. Any idea which star it might be? 3. Ha ha — what kind of outdoors thing were you thinking of? Hiking? Paintballing? Thanks for contributing! Really interesting answers. 5. In our country smoking inside and near apartment houses is prohibited, but people may smoke in their flats. So the question: are they allowed to smoke on their balconies while the smoke spreads into the other flats? Wow — that’s an interesting one (about the smoking). I’m not sure where I stand on that. Personally I don’t mind the smell of smoke, but a lot of people do — so I guess it’s invading their private space. I suppose you could argue that the smokers can always just go outside, right? What did the smokers argue? They say “It’s my place and I’ll be doing everything I want here. If the smoke bothers you — close your windows, don’t disturb me while I’m smoking”. These people often confuse “liberty” with “permissiveness” and doesn’t respect rights of citizens who don’t have such a bad habit.